It’s here! 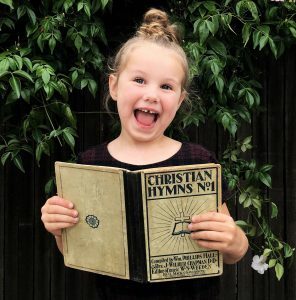 Our hymn of the month plan for 2019 is officially done. Your requests were heard. Many of you will recognize songs that YOU chose for this year (via an Instagram discussion from August). There may be some that are new to you. There are a few that are new to us too! There is probably more than one good ole favorite. All of them are chosen with holy days and holidays and even camping season in mind. And of course all are doctrinally sound with good theological bones and are ready to be planted in little hearts as well as big ones. And I’m sure I don’t need to warn you… But I will anyway. This list could change at anytime. Things change in this community. Hard things happen. We want the hymns that we are committing to memory to reflect the cry of our hearts. We’re praying that the choices here will be a blessing to you all. So friend… Will you join us for a year of memorizing these beautiful lines? Will you join us as we gather up our families and worship the Almighty together? We truly hope so. Know that you are welcome to sing along with us or choose your own hymns according to your family’s desires and rhythms. Whatever you choose, it’s a privilege and honor to be worshipping alongside you and to sow seeds of truth into our children’s hearts together. May God be glorified in His singing people.